The Maine Lobster Lady Story! This whole thing started while hauling Lobster traps aboard the “Shock Wave”, my island Lobster fisherman partner, Greg’s, Lobster boat. Oftentimes, my catch in the traps included “Maine Peekey Toe” crabs which I would save out and bring home to pick the luscious meat each evening and the next day, set out the freshly picked meat on ice in a cooler on an old Lobster crate with an empty mason jar and a cardboard “Fresh Crabmeat” sign. Each day when I returned from work aboard the boat I’d find my cooler empty and my jar full of cash-I was hooked! Nowadays Fresh Crabmeat is DOUBLE that price! My tiny business grew to where I added several more old crates covered with a red checkered tablecloth and an umbrella stuck in the ground and offered Lobster Rolls, Crabmeat Rolls, soups, baked goods and preserves as well as fresh vegetables and flowers from my garden. Eventually I gave up working on the boat to stay on terra firma and tend my growing business. Soon folks started asking me to come to their island homes to prepare dinner parties where they could entertain their “come from away” guests without having to do the work themselves. There are no restaurants on Isle au Haut and this provided a novel opportunity for islanders to take their guests out to dinner without leaving home. A win, win!At around the same time the only inn on the island was put up for sale and I saw an op portunity to feed my culinary longings and fill a niche that was soon to close. I found a gorgeous turn of the century home situated right on the water with an owner willing to let me renovate and start up a new inn business, which included a 14 seat restaurant where I could offer overnight accommodations with all meals included while still catering to the summer population as a place to take their guests for amazing 5 course dinners dinners with an equally amazing view…my Island Inn dockside dinner table. Little did I know then that the logistical issues of ordering and receiving supplies from the mainland, coordinating guest arrivals and departures by boat along with all the other difficulties of running a business on an offshore island were preparing me for what I now know is what I am meant to be-a Food Trucker, specifically a Maine Lobstah Roll Food Trucker! While visiting Greg’s daughter in the Phoenix Arizona area during Christmas, we saw first hand the deprivation of all things seafood and the lightbulb went on. Knowing the Maine Lobster industry from trap to table, it seemed a no brainer to bring a taste of the best Maine has to offer in the form of Maine Lobster Rolls, along with other traditional Maine fare to the incredibly Lobster/Seafood deprived. Winter of 2010 was spent developing a plan to do just that. Visiting Lobster processors turned up one with a unique process which uses only wild caught, sustainable, Maine Lobster, traceable back to the boat that caught it. Bingo! I formulated a plan to get my supply from Maine to Arizona, which is now my proprietary process, had a 16′ trailer built and wrapped, applied for and got all the necessary health department permits and started applying to venues that I thought would be a good fit for my menu. 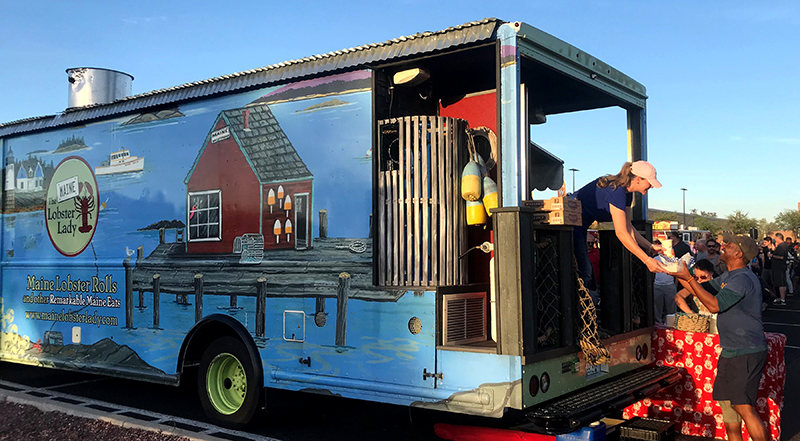 After 8 years of operating my island inn, I closed up shop in late September of 2011 and in January of 2012, along with Greg and my 3 daughters, The Maine Lobster Lady Food Truck made her inaugural appearance at The Barrett-Jackson Classic Car Show and Auction in Scottsdale, Arizona and it’s been a whirlwind ever since. We continue to return annually to this prestigious event as well as others including Scottsdale’s Arabian Horse Show and The Scottsdale Festival of the Arts to name a few, even traveling to Las Vegas each spring for a large Food Truck festival! In addition to my Traditional Maine Lobster Roll (which can also be ordered Connecticut Style-warm, drizzled with melted butter) my menu includes other Maine fare such as Lobster Bisque, Seafood Chowda, Lobster-Lobster Mac & Cheese, Fried Whole Belly Maine Clams, Fried Haddock Sandwiches, a wicked healthy and beautiful salad topped with Lobster, fresh veggies and fruit and my special Blueberry-Citrus Vinaigrette, Maine Blueberry Lemonade and Homemade Whoopie Pies. All menu items are scratch made right on the truck. We have been operating seasonally in Arizona, returning to Maine for the summer months in order for Greg to keep up his Lobster fishing business while I operate a version of my Maine Lobster Lady truck on Isle au Haut. Check out our Arizona schedule and stop by and see us, we cant wait to see YOU!